I am so humbled and honored by this! I knew going into the swim that the fastest time was 10:22. Never in a million years did I ever think I would finish faster than that (certainly not under 10 hours). But the beauty of this sport is that you have to take what nature gives you – good or bad. And, thankfully, Cape Cod Bay was pretty kind to me! I got the benefit of a nice current and a relatively favorable wind. And, while it was pretty choppy for a good chunk in the middle and for the last three hours…I don’t mind swimming in the chop. All things being equal, I would never have been the fastest amongst the 6 others who have previously completed this swim. I truly was lucky number 7! Many thanks and admiration for Greg O’Connor, David Barra, Janet Harris, Eileen Burke, Mo Siegel and the late Russell Chaffee for paving a trail for this swim. It is a beautiful swim and I hope many more people will experience it. We started around 6:02 a.m. (a little later than expected). The conditions were very clear and calm at the start, nearly flat. But, pretty quickly after I started, the fog began to roll-in and almost enveloped us. Visibility got down to less than a 1/4 mile in any direction. But, thankfully, as the sun got higher in the sky, the fog began to lift and burn off. The seas turned a bit rough about 3 hours in and never really calmed down. The wind was blowing from the south at points and south/southwest at others and I got the benefit of a big tide. There were jellyfish at the start, and jellyfish throughout. Thousands of them. They were beautiful to watch doing their jellyfish thing. They stayed with me for the entire swim. Mostly, they were non-stinging jellyfish. Unfortunately, I did put my hands/fingers through many of them and I apologized in my head for causing what assumed to be their demise. I did get several stings from something. One down my suit, one on the left side of my neck, then one on the right. They seemed more than just sea lice – but who knows. I was just thankful that the stings lasted only about five minutes. I found it ironic that the water’s surface was awash with wind and chop, yet the jellyfish below the surface were entirely unaffected by the turmoil above. It seemed a bit like a metaphor for life – while there may be chaos around us, we can still be calm and settled inside. Or, perhaps what is happening at the surface isn’t always what is happening underneath. Obviously…LOTS of time to think big thoughts out there! 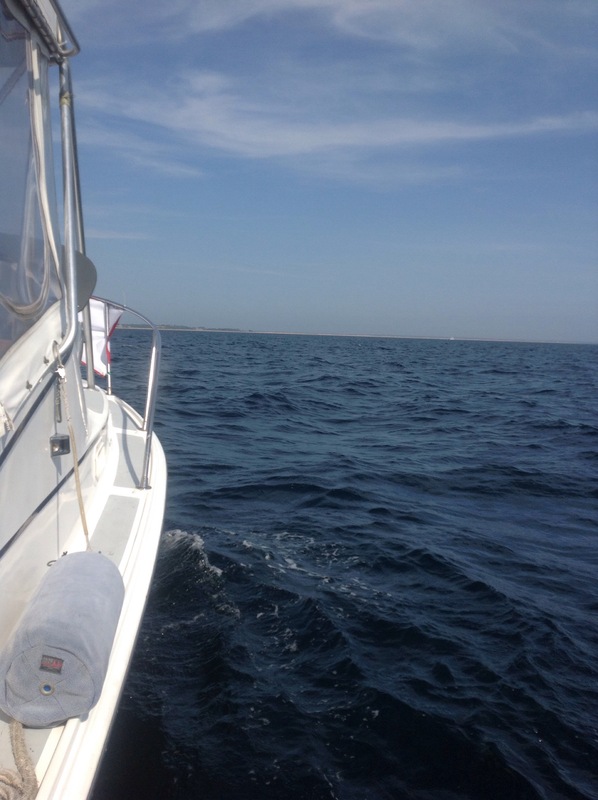 While I had been a bit stressed about the recent great white shark sighting in Cape Cod Bay, once in the water I never really thought about whether they were out there. I did have a very large shadow appear beneath me at one point and it certainly made me wonder. Because of there had been quite a few recent sightings, we used a shark shield off the side of the kayaks. The shark shield emits an electronic pulse that essentially bothers the Ampullae of Lorenzini in their snouts – although they have to get pretty close for it to have any impact. I also knew of the shark-deterent wetsuit designs they are using in Australia. Apparently, sharks see primarily in black/white. As a result, wetsuits are being designed with black and white stripes. There are also stickers for the bottoms of kayaks and surfboards with black/white stripes. I decided it couldn’t hurt to put some dark zinc stripes on my legs. I didn’t have black – but figured purple was close enough. 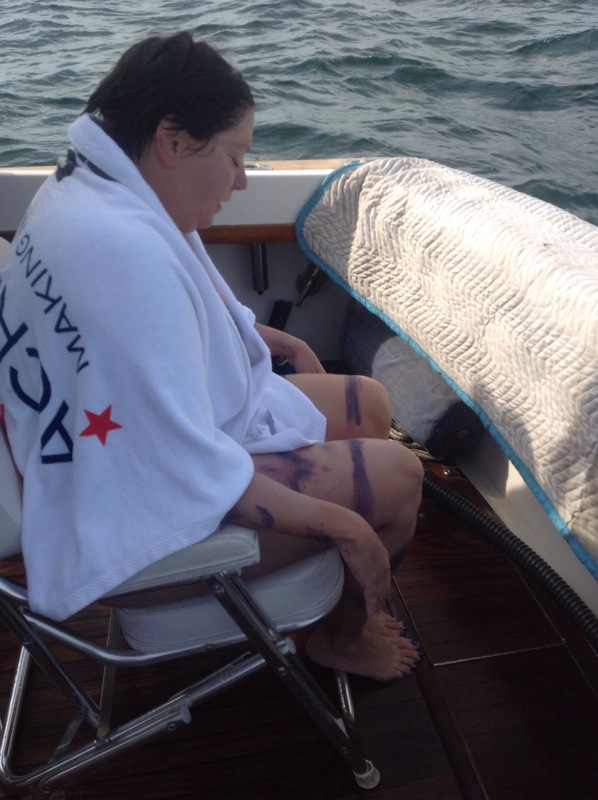 So, I applied on my legs some “war paint shark deterrent stripes” (now being referred to by my friends as Paulk Shark Marks). I mean – what could it hurt! After I jumped off the boat, the boat captain said to Matt, “You realize there was a shark sighted this week right where you just put your wife in the water.” I’m VERY grateful he said that to Matt after I got in the water! About 24 hours after my swim, we learned that two female kayakers were attacked by a great white within yards of where I started my swim. While we had joked a bit after my swim (once we were safe) about sharks, this news report seemed to jolt us back into reality. Would I have been safe without a shark shield or the Paulk Shark Marks – probably. But, am I happy to have had the shark shield – yes. I will never know if it actually deterred anything in the early morning hours off of White Horse Beach/Manomet near where those kayakers were attacked. But, if it did, I’m happy for it. All in all, the water conditions were beautiful. It was in the upper 50s at the start, but warmed after about an hour to the low-mid 60s and it just kept climbing slowly throughout the day. The sky was cloudless and the air temp was warm. The wind was either coming from my right out of the south or from slightly behind me – which was a welcome change from the rest of my recent swims. While the water is not as blue as in the Catalina Channel – it was a wonderful clear blue/green. The crew saw several whales during the day. And, there was a sailboat regatta off of Provincetown that made for quite a show. Other than the jellyfish and the whales – I didn’t see any fish until the very end of the swim when I popped up and told Pat and Terry that I had a welcoming crowd of fish. About 8-9 hours in, there was apparently a debate on the boat about whether to tell me that I had the chance to finish in under 10 hours and/or break the record. While I don’t typically like to know how much farther I have to go, time, etc., Matt decided that it was best to tell me. I didn’t have an exact sense of my time, but the crew had dropped several hints along the way that I was making speedy progress – so this didn’t come entirely as a shock. Once I learned that it was truly a possibility, I kicked it into a higher gear (and was thankful that I still had a higher gear). I increased my stroke rate so much that Matt actually stopped me to let me know what it was so I didn’t crash before I got to shore. Pat and Terry were yelling for me to go. Unlike some of my other swims, it was pretty exciting at the end! I hit the beach and learned I had finished in under 10 hours and did a little dance on the beach. Several people on the beach came over to congratulate me. While I have trained hard this year, I am typically one of the “slow swimmers” in the events that I do with others. I finish in the middle or the back of the pack and I am always okay with that. To me, open water swimming isn’t about winning, it is about the journey. It always has been. So, to now have the record for the fastest time across Cape Cod Bay is a bit odd – but also pretty fun. I truly would have been okay if I had gotten the record for the slowest time across Cape Cod Bay. But, to me, having the fastest time speaks to what is amazing about this sport and its relative unpredictability. Those of us who do these swims understand what it feels like to stand on shore and look out across a body of water where many times you can’t see the other side. Standing on that shore there is excitement and anticipation. There is concern about the unknown, about what lies beneath, of the water and air temperature, the wind and chop, the current/tide, and the ability of your body to handle the conditions and your feeds. And you wonder, when you hit your dark places (because you will hit them) whether you will be able to work your way through them enough to allow you to continue on swimming. But, despite all of that, we do these swims because of what it feels like to walk up onto that distant shore and turn around and look back having worked through the dark places and overcome all of the things that concerned us on the other side. We found a way to put the left arm in the water, and then the right arm in, until we got to the other side. I could not have gotten across Cape Cod Bay without my amazing crew. Special, heartfelt thanks to fabulous kayakers Pat Kerrigan and Terry Lopatosky, outstanding crew members Amy Frick and Sarah Hunt, observer extraordinaire Elaine Kornbau Howley, and most of all to my wonderful and supportive husband Matt who tolerates my nonsense and makes me laugh. She’s coming in hot! Courtney has picked up her stroke rate and hoping to be in Ptown soon! The beach is getting closer and closer. We just spotted the second whale of our journey! Pretty cool. 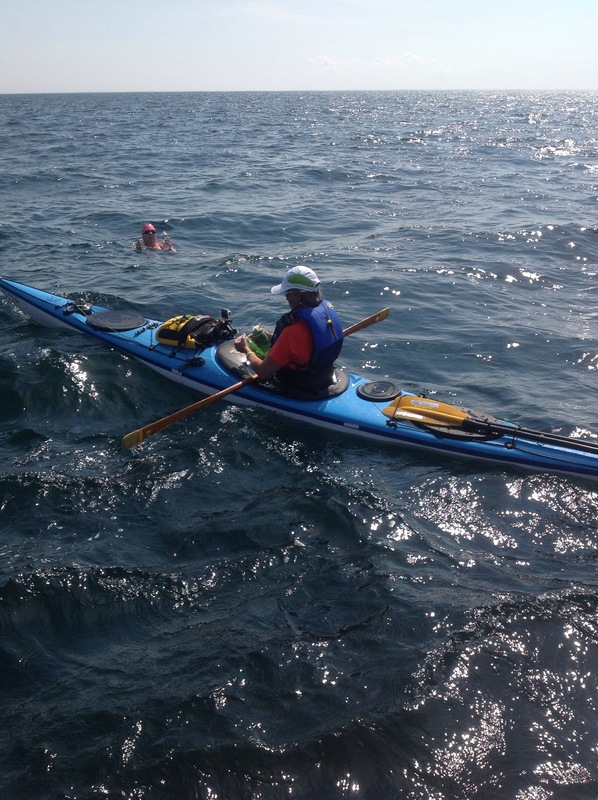 Both kayakers are headed out for the final stretch of Courtney’s swim. Courtney reports that she is doing well! If she keeps up the good work she will complete this swim in much less time than she anticipated. Courtney is rocking this swim! She’s getting a nice push from the water. The boat captain is very impressed. Courtney just put in her next feed order that we will deliver in 20 minutes.